The graphics on our car has been on the streets for only a few days and already we have had lots of positive feedback and people asking who designed the graphics. 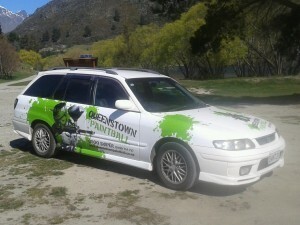 We have had a great team of people working with us in re-designing the marketing side of Queenstown Paintball. Feast Creative have done all our graphics, including our logo, car, brochure and website. Scott and his team once again have outdone themselves. These guys are very clever at what they do. We highly recommend using them to anyone wanting their business to stand out. Hana and Merrin at Social Media Sorted brought us up to speed with how best to use Facebook and Twitter as a marketing tool, which was very foreign to us. They even gave us a handy little book to refer to in future. Merrin, in conjunction with Feast Creative, designed our website and did a brilliant job. Sign It Signs applied our car graphics, which look amazing, using Sign It signs is a must when getting signage done. Manual Print Studio did our T-shirts. It’s the first time we have used these guys, they are so easy to work with and the end product looks great, we will definitely be back for more. We just want to say a huge thank you to you all, your work is to the highest level and you are all very good at what you do. We are so grateful that we were able to use you all to get Queenstown Paintball to the point where we believe we will now stand out from the crowd.